I’m trying to remember where I first picked up A Wrinkle in Time. What about it spoke to me? 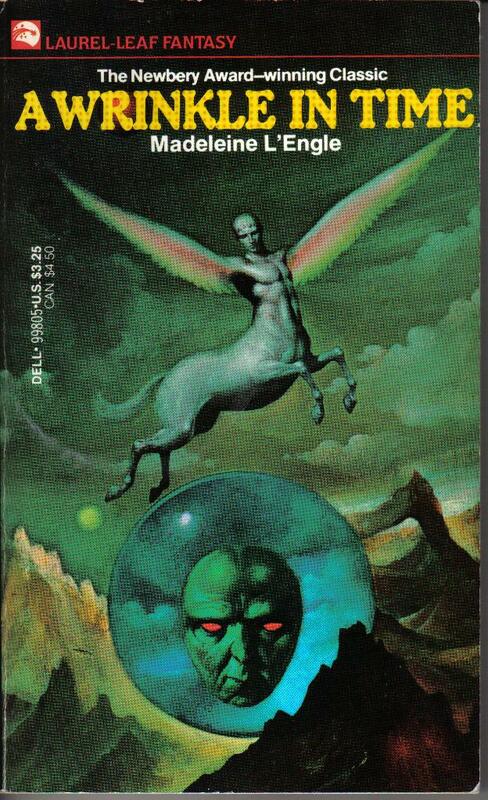 The paperback cover in those days was a bit frightening—a rainbow-winged centaur above the terrifying face of the major domo of Camazotz. Try as I might, I just really can’t remember how the book came into my hands. Whatever it was, my nine-year-old self latched on to it like a life raft. It’s the first book I can distinctly recall reading over and over AND over. I read it until the front cover fell off. I read it until I could practically recite the entire first chapter. It can’t have been the first book that spoke to me—I had loved many books. To that, the school librarian could attest. But it was the first book, I think, that understood me. It was also the first book which made me understand that books are written by real people, that there was someone on the other side of the shelf—the wizard behind the curtain who was, in fact, not a wizard at all. In third grade, I was given the assignment of contacting my favorite author and interviewing her. So, I chose Madeleine L’Engle, thinking there was absolutely no way I would hear from her, convinced that perhaps she wasn’t real. Not long afterwards, an envelope arrived. Inside was a pamphlet about Madeleine L’Engle with a black and white picture of her on the back. I stared at her for a long time. She was wearing a wildly-patterned caftan with giant hoop earrings. She had a wicked grin and knowing eyes. She was the sort of grandmother I would have adored—the one who never seems to age until she’s suddenly really old, the one who is always wise and still always wild. But was she real? Then I saw she had written to me. It was something kind and encouraging (and how I wish I could have found that pamphlet—I know I have it somewhere! ), typed above her photo. Her note was signed with a looping, graceful signature. And that was the moment when she became real to me. Her hand had touched this piece of paper. Where my fingers held the thick, creamy paper, her wrist had moved across it, making these elegant lines. She was real. A real person had written this book that I loved. And perhaps if she was real and books could be made by real people, then I could make books, too. In that moment, she had signed and sealed me to my fate just as surely as she had the pamphlet I held in my hands. It was a leap that, under the circumstances from which I came, I’m still not sure how I made it. But once made, I couldn’t go back. Since age nine, I was determined I too would write. It took a long time to make that dream come true. (And later when I learned just how difficult it had been for Madeleine to find a publisher who believed in Wrinkle, I felt justified in naming her my patron Muse). I wanted very much to meet Madeleine and thank her, but I knew I would have been dumbfounded. I tried to write her, but the words would never come out quite right. I was very sad when both she and Lloyd Alexander (another favorite from childhood) died in 2007. I still treasure that worn copy of Wrinkle and that magnanimous signature. The first time I signed books, I thought about Madeleine’s hand moving across the page, and though I’m not entirely sure I believe in angels, I would swear I felt her looking over my shoulder, making sure I got it right. Tiffany Trent is the author of the Hallowmere series, and of The Unnaturalists. You can find her on the web at www.tiffanytrent.com, or on twitter as @tiffanytrent.